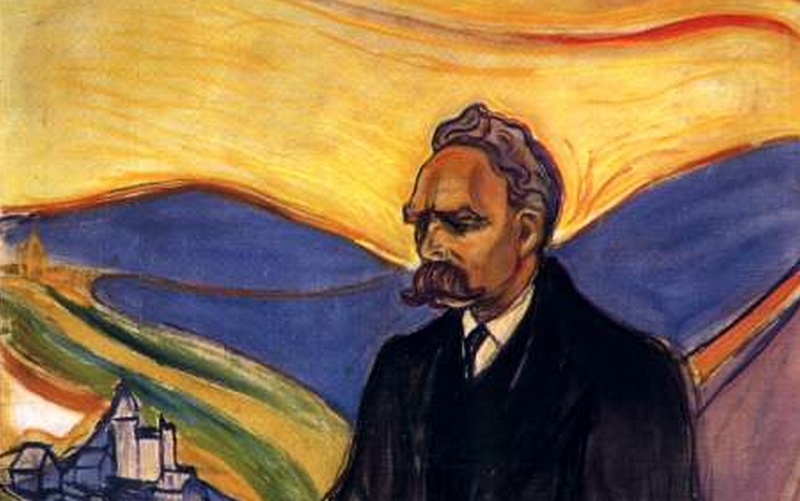 Edvard Munch, “Friedrich Nietzsche,” 1906. This essay has been drawn from Vol 1., No 9. of the American Reader, available in our Shoppe. Translated by Steven Corcoran. Peter Sloterdijk’s Nietzsche Apostle, from which the below essay is drawn, is a short but powerful work published on the 100th anniversary of Friedrich Nietzsche’s death. Written as an anti-eulogy, the book on some level refuses to acknowledge the philosopher’s passing, choosing instead to uncover the living Nietszche who remains hidden beneath our contemporary scrapheap of self-eulogizing language and belatedness. This Nietzsche, it turns out, is a megalomaniac, one who successfully projects himself into the future by the sheer force of his vanity, thus making Sloterdijk’s book possible in the first place. The below essay, “Total Sponsoring,” traces this megalomania and underscores its literary value. In the process, it seems to me, it invents an altogether new rubric for understanding the work of literary authors. Whoever speaks in the conditions permitted—whether from a bourgeois, political, academic, legal, or psychological perspective—will always be in the minus and run around in vain seeking the means by which to pay off and shift overdrawn assertions. Whoever speaks incurs debt; whoever speaks further, discourses in order to pay back. The ear is educated in order so as not to give away credit and to interpret its avarice as critical consciousness. Against the grain of “permitted” discourses, Nietzsche Apostle slyly asserts itself as a work of literary theory, a rewriting of literary transmission. Sloterdijk imagines this new model of transmission as a gift economy without debt, and he elects Nietzsche as its inaugural “sponsor.” As a theory of the author as sponsor, it remains somewhat incomplete, but this seems to be Sloterdijk’s point. His hope, however megalomaniacal, is that a debtless reader will complete the work, paying it forward in kind. To learn more about Nietzsche’s theory and praxis of generosity, it is also—or above all—necessary to address his “megalomania,” supposing this an appropriate designation for this author’s extraordinary talent to speak about himself, his mission, and his writings in the highest of tones. Perhaps this issue here is one for which the expression addressed to the publisher about the “good news,” “something for which there is yet no name,” is once again appropriate. The alternative designations used to encompass the first parts of Thus Spoke Zarathustra, “Poem” and “Gospel,” should also be kept in reserve as a way of qualifying Nietzsche’s megalomaniacal remarks. Megalomania, then, or poetry, or something for which there is yet no name: what follows is advisably approached with a provision of alternative expressions, to avoid getting stuck with a designation reflex that is first best. The exposure value of Nietzsche’s most conspicuous statements about himself are so excessive that even the most favorable, the most free-spirited reader, yes even those who are willingly dazed, will look away from these passages as though not wanting to have perceived, to have countersigned, what has been committed to paper and put into print. It is possible to stare fixedly neither at the sun nor at the self-praise of the mad—for this reason we read these unbearable outbursts of self-awareness with self-praise protective eye-wear. We tone down that which cannot penetrate unfiltered into a reader’s eyes without his having to look away out of a sense of shame for the unbridled other, or else out of one of tact, which advises us not to use the moments in which an excited person bares himself against him. Among Nietzsche lovers it is a mark of decency not to cite this sort of thing, is it not? Today, however, we must deviate from the norm of the amateur. I would like to suggest that we dwell a little longer on these unbearable phrases and slowly remove the protective eye-wear that has for a century spared readers the need to engage with this eruptive, obscene profusion of self-praise and self-objectivization. I make this suggestion on the assumption that we are dealing not with some subjective disinhibition in the usual sense, or with a morbid way of letting oneself go, or even with traces of puerility, as commentators like Thomas Mann and Karl Jaspers have discerned in Nietzsche. Against the aforementioned background of language philosophy, it seems plausible to assume here that the dam behind which the self-eulogistic discursive energies had been accumulating in the most advanced civilizations finally burst, in a single individual. Today we enjoy a safe distance of one hundred years that enables us to see these detonations of self-awareness from sufficient distance. Added to this, we benefit from a large shift in mentality, a shift that traverses the twentieth century toward a greater permissiveness in the expression of narcissistic affects. And, finally, Nietzsche’s description of himself in Ecce Homo as a “buffoon” suggests the prospect of considering his Dionysian exaggerations from the aspect of voluntary grotesqueness. All this makes it easier to bracket the embarrassment and muster up a bit more courage. If a life’s elevated possibilities increase, self-praise can unfold in analogue fashion: once again the work praises the master, who is poised to disappear into the work. And it is precisely this correspondence that creates the scandal—this limitless talking up of manifest and squandered wealth, this jubilatory self-review after the deed done, this complete dissolution of life in luminous positings, which remain as works of language: they form the counter-offence to the offence of the cross, exclaimed by St Paul, with which the blockade against the connection between self and praise was solidified. Singing-one’s-own praise of a life which affirms and realizes itself as artistic composition is rightly seen as the only authentic discursive form still able to merit the qualification evangelical. As message this form is simply good, when and if it comprises the self-communication of the successful—and a sympathizing with it. It speaks the language of a life that not only has the right to make a promise but can also endorse it—and the bigger the resistance provoked by the affirmation, the more authentic its occurrence. One might call the language-traces of such a life Spinozist since they are “expressions” in the sense that they serve to announce a force of being. They breach the constraints of traditional bivalent logic, which had required for the speaker always to choose between one of two things—either vouch for god, which was unavoidably connected with the refusal of the hateful ego, or vouch for the Ego, which traditionally could be understood only as the satanic renunciation of god. In the new language position Nietzsche presents himself not as a poetic redeemer, but instead as an enricher of a new type. One could label Nietzsche the first real sponsor, on the condition that we devote some time to explaining his art of giving gifts that exceed the common discourse of gifts and poisons. Nietzsche’s sponsorship of humanity starts out with the assumption that, by giving individuals ordinary gifts, one implicates them in a base economy: in this economy, the enhancement of the giver inevitably goes hand-in-hand with the offence of the receiver. If anyone seeks to give a more distinguished gift, it can only involve the giving of an unreciprocable gift with no strings attached. The only gift measuring up to this ambition is the bestowal of a title of nobility, which excuses the new bearer from the obligation to refer to the bestower. With this in view, Nietzsche invents some take-and-run gifts that take the form of aphorisms, poems and arguments. After Nietzsche it is possible for anyone to become noble if he rises to the sponsor’s challenge. But this discourse about titles of nobility is itself provocative: what the sponsor bestows is the opposite of a title that one could “bear.” The nobility in question here cannot be gleaned from any of the historical forms of aristocracy. This is Nietzsche’s decision thesis, namely the idea that the history of humanity is yet to know real nobility—except perhaps in the mild idiocy of the figure of Jesus and the sovereign hygiene of Buddha. However, in his view the latter incarnate deficient forms of generosity, since both are grounded in a retreat from the vita activa. They are waiting to be outdone by world-affirming, creative attitudes toward life—whence arises the ethical mandate of art, for the entire dimension of future history. From then on, historical nobleness possessed as a good has no value, because what could be designated as noble in feudal times was scarcely anything other than power-protected meanness. “The rabble above, the rabble below”—the words by the voluntary beggars about the rich and powerful of the present moment, to be found in the fourth part of Zarathustra, apply retroactively to historical evidence. The qualifier noble can no longer be defended through convention, to the extent noble should be the title for the birth of a deed or a thought based on an unresentful, far aiming force. Nobility is a position with respect to the future. Nietzsche’s innovative gift consists in provoking one to engage in a way of being in which the receiver would take up an active force as sponsor, that is to say, in the ability to open up richer futures. Nietzsche is a teacher of generosity in the sense that he infects the recipients of his gifts with the idea of wealth, which is necessarily not worth acquiring unless with a view to being able to squander it. It pays to take a closer look at the original act of the generosity-chain inaugurated by Nietzsche, since conditions of bonding can be seen in it, from which it is alone possible to draw the sole valid criterion for enabling us to divide legitimate from illegitimate references to Nietzsche. It is decisive that the new “loose” chain begins with an unconditional gesture of expenditure, since the giver can only breach the circle of a savings-rationality through pure self-expenditure. Only unbilled expenditure has sufficient spontaneity and centrifugal force to escape the gravitational field of avarice and its calculus. Savers and capitalists always expect to get more back than they stake, while the sponsor gets his satisfaction without any regard for “revenue.” This applies to sentences as much as to donations. What Nietzsche calls the innocence of becoming is essentially the innocence of expenditure and eo ipso the innocence of enrichment, sought for the sake of the possibility to expend. The leap into generosity transpires through affirming the prosperity of oneself and others, since this is the necessary premise of generosity. If there is a leap [Ursprung] into generosity, then it resides in the challenge that open generosity makes to concealed generosity. Part of Nietzsche’s idea of the art of giving is that the giver—if he cannot remain concealed, which is a priori impossible for an author—cannot present himself in a false perfection, since he would thereby lie his way out of the world and continue simply to fool the receiver, which is tantamount to a humiliation. Rather, when encouraging the receiver to accept the donation, he should also disclose his infirmities and idiosyncrasies, however without denying the level of the gift. Only this yields the “master-art of kindness.” ((Thus Spoke Zarathustra, op. cit., IV, p. 218.)) A little vanity, a little turning in the narcissistic circle must come into play. Integral self-affirmation encompasses the everyday things that the regime of metaphysical misology had talked down, and stands in gratitude to them for the gift of being able to give. In this exercise, Nietzsche, the enlightener, can abide by the nineteenth-century custom of explaining authors on the basis of their milieus. If the author is immortal, his tics will also be. If Zarathustra emerges with his language of self- and world-affirmation, this language must convey the pressure of provocation through its radically self-eulogistic and “wanton” form. The impact of Nietzsche’s sayings and arrows, which take the form of pure dictates, become for easily provoked readers a therapeutic insult eliciting an immune reaction. This corresponds to a vaccination procedure at the moral level. Anyone who has become a sponsor some other way will perhaps know that it is possible to become one without Nietzsche. Those who are not yet sponsors, however, can experience how he infects them with the memory of the possibility of generosity—a memory that the receiver cannot let sit, to the extent he is ready and able to enter into the noble space of resonance. That the non-receivers pursue other dealings is, on another level, certainly also perfectly fine. Erupting from the motive of “virtuous giving” is a spring of pluralism leading beyond all expectations of unity. The nature of provocative generosity is such that it is unable to be alone and wants even less to be so. The sponsor’s generosity as such aims to generate dissensus, which is to say competition. It would consider itself to have failed were it to be said it had obtained a monopoly. To be as it would like to be, it must posit competition. It would prefer to lay itself open to rejection, than it would to subordinate imitations. The generous, then, stand in opposition to the good, who for Nietzsche are rightly called decadents, since they—as we have known since the Genealogy of Morals—pursue the dream of monopolizing merely good sentiments. For them, bad is anything that expects that they prove their goodness; while anything which belabors their consensus with questions and exits their circle of blackmail strikes them as immediately devilish. In Nietzsche, decadence represents the epitome of conditions in which resentment is guaranteed it will always hit upon its ideal language situation. The relations bearing witness to decadence are those in which “the yes-man [Mucker] is in charge”—to put it in Nietzsche’s words. If the good are so good, it is only faute de mieux. The decadence ideal holds power only so long as, and because, “it has not had any competition.” ((Ecce Homo, Cambridge, p. 136.)) That is why if one wants to oppose the better to the good in questions of gospel, one must resolve to count to five.